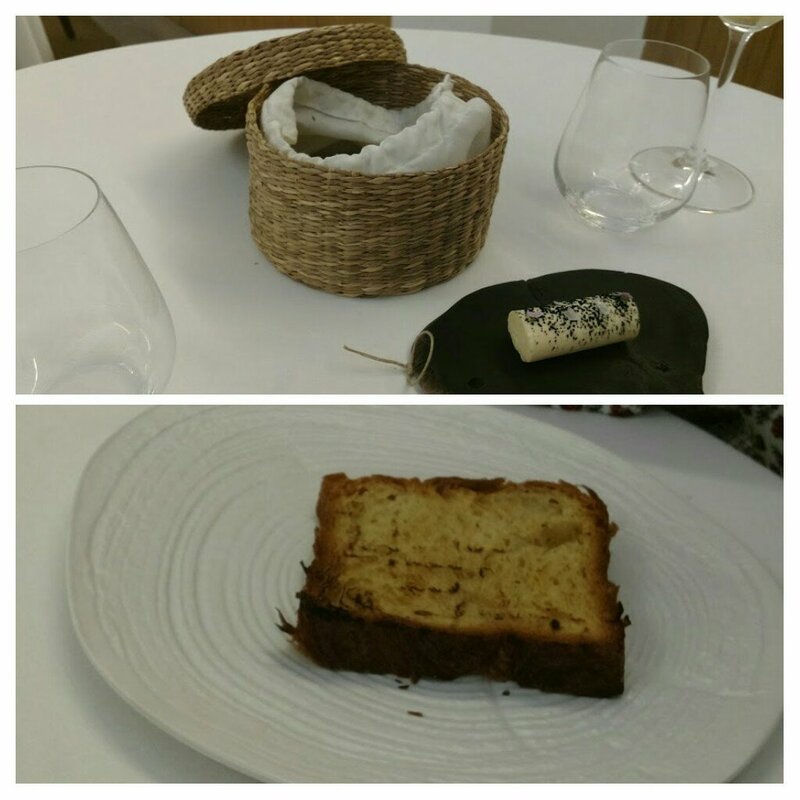 Looks can be deceptive and this has never (to my mind at least) been truer than of Restaurante Choco – a one Michelin starred place in Cordoba, Southern Spain. Located away from the beguilingly beautiful historic centre of Cordoba, it is in what I would describe as a “functional” modern suburb (which is a bit rough around the edges). 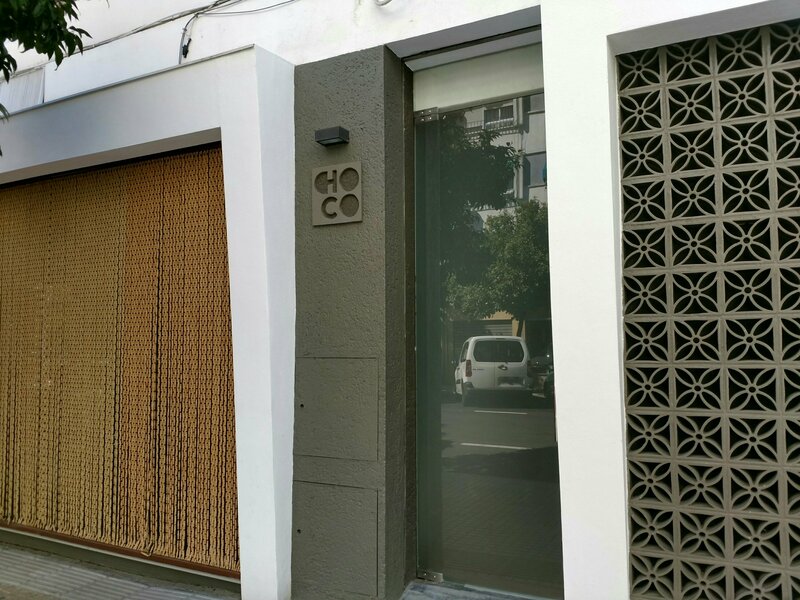 Unlike much of Cordoba, pretty it ain’t and the exterior of Choco is pretty non descript (we only clocked it as we saw chefs coming out of the place). Behind this, dare I say, bland exterior sits (to my mind) an outstanding restaurant. Wood did add a touch of warmth, but not much. When you enter you are seated in a lounge/reception area. It was here, rather than at the table, where the “amuse bouche” elements of the meal were served along with an aperitif. I quite like the informality of this approach. A very generous pour, served in a proper white wine glass rather than a copa (I much prefer the former), this had some lovely nutty notes and more than a hint of citrus in the mix. A perfect aperitif and nicely priced (for a Michelin star gaff) at under €4 a glass. 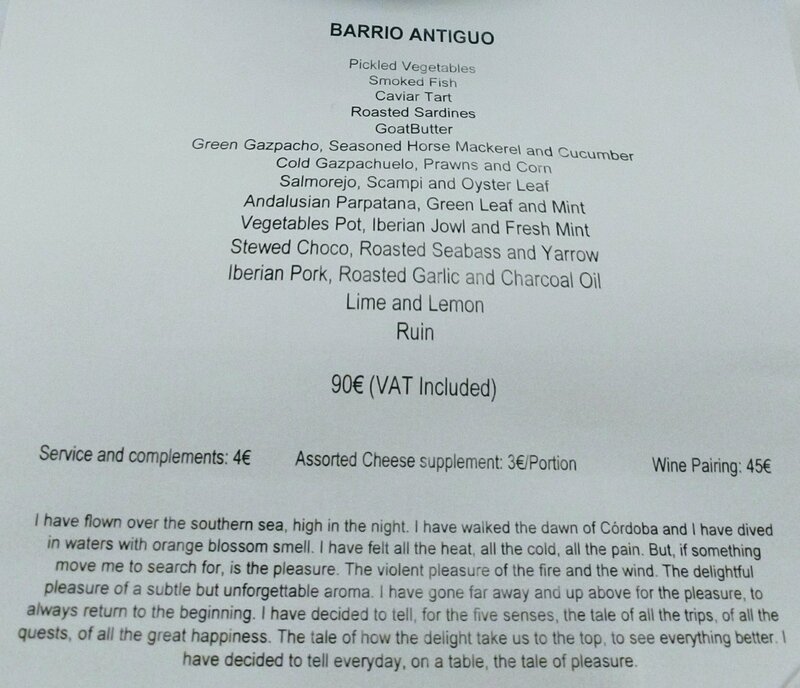 and the longer, 17 item, “Kisko García” menu, named after the chef. Neither are cheap (by any stretch of the imagination), but I was in total holiday mode and don’t mind paying that sort of money for really good food (as a treat, once in a while). 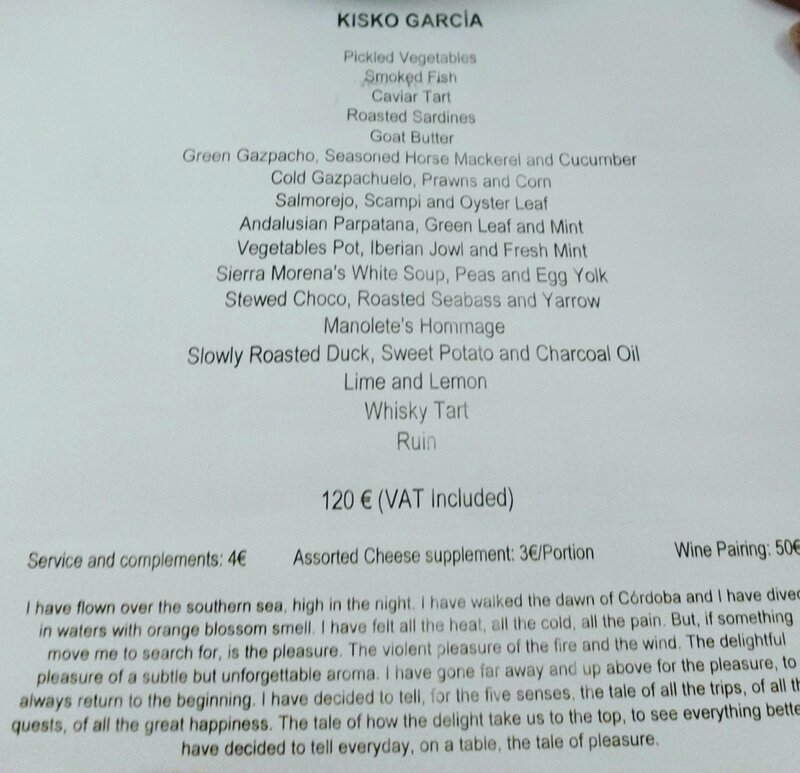 As such Mrs. SF and I though what the heck and went for the longer “Kisko Garcia” menu. 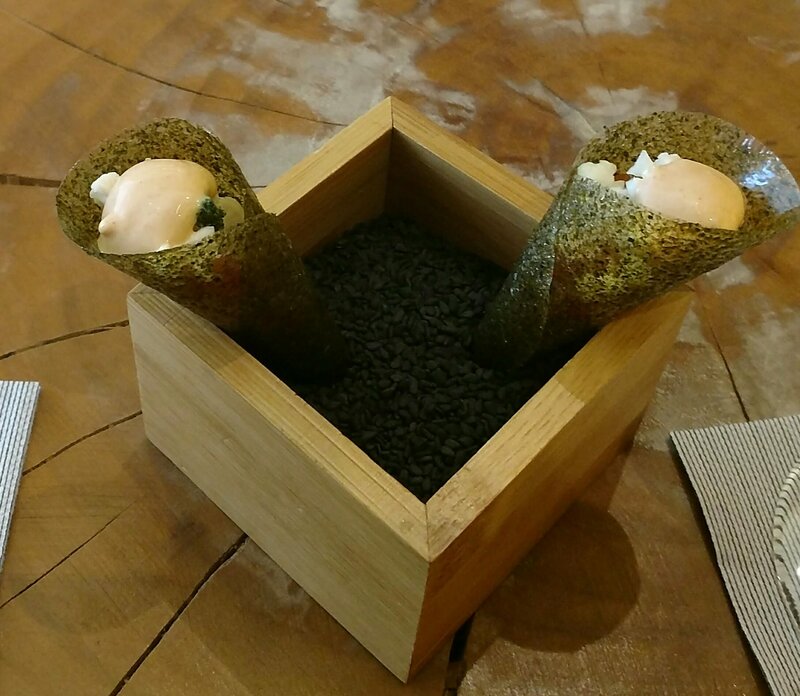 First up were seaweed cones filled with picked vegetables. The wafer thin (read a paper through it) nori type seaweed enclosing crisp, lightly pickled vegetables and a rather superior Marie Rose style (probably doing it a huge disservice calling it that) sauce. Very nice balance of salt, sour and sweet this. Next was a rather disconcerting looking dish served on a fish’s back bone (tail intact) and a basalt rock (“We Want Plates” would, I suspect, spontaneously combust on seeing this) billed as simply “smoked fish”. 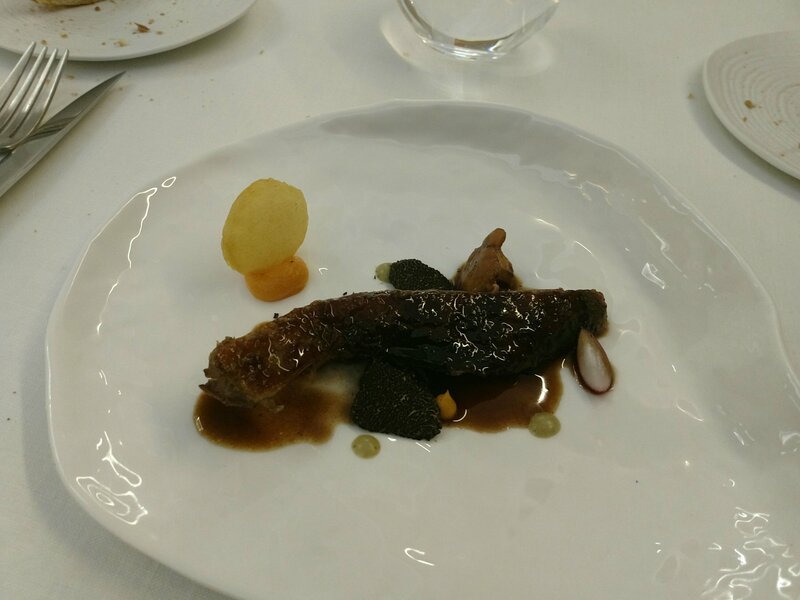 This was a smidgen of lightly smoked mullet (from the local Guadalquivir river) with a topping of a delicate cream cheese based mousse. Some crisp greenery added a nice bit of crunch for texture. Bit fiddly this, as you were supposed to eat it with tweezers. Being cack handed, at the best of times, I expected to struggle with this and to have it end up in my lap. Luckily I was more dexterous than I expected and it reach my gob without any drama. Mrs. SF was less fortunate (but her quick hands saved the day). Can’t say was totally enamored with the presentation style, but the flavours were knockout. An impossibly light and crisp casing held a gloriously rich and silky seafood emulsion studded with caviar. All three worked perfectly with the nutty, yeasty (with hints of citrus), flavours of the Montilla – Moriles wine. Next we were led into the kitchen and introduced to Kisko Garcia (a very unassuming man given his talent in the kitchen) and his sous chef, who cooked/finished off the next course for us in the kitchen area. This consisted of a piece of sardine fillet (hugely underrated fish here in the UK in my opinion, but rightly beloved in Andalucía – just go to any chiringuito on a Malaga beach and order the espetos) on a beignet (filled with an intense tomato concoction), with the sardine cooked “a la plancha” and lavender added to create a perfumed smoke. The smoke from the lavender lightly infused the already charred sardines and the tomato filled beignet, adding nicely to the intensity of the flavours. We were instructed to eat it in one go and from the aromas coming off it I didn’t need to be told twice. Clever stuff this, with the natural intensity of the flavours of the sardine and the lavender (a very light touch is required with that stuff) working together rather than at odds with each other. Spread thick on some brioche toast it was a delight. I could have happy eaten it without the bread. Moving on, Andalucía has a rich tradition of soups (think gazpacho, salmorejo and ajoblanco to name but a few) and the menu here draws heavily on this tradition, though in a typically playful and inventive manner. This was like no gazpacho I have ever had, with the soup rich with green pepper and sourness. It also had a touch of heat to it. On asking, we were told its base was green tomatoes (with green peppers and cucumber) and that the heat and sourness came from a chilli and coconut vinegar mix the chef had discovered in the Philippines. Sat in the soup were, charred on the outside and pretty much raw on the inside, pieces of horse mackerel. Oily and rich these worked as a lovely counterpoint to the freshness of the gazpacho. This was a beautifully balanced and refreshing dish. Almost ethereally light and in stark contrast to a, usually quite thick, traditional gazpacho. The sourness, heat and almost citrus notes worked perfectly to get the appetite really going. This was Mrs. SF’s favourite of the soups we had. No this isn’t one of my often and many typos, with gazpachuelo (a distinct dish from gazpacho) being a Malagueños fisherman’s soup. 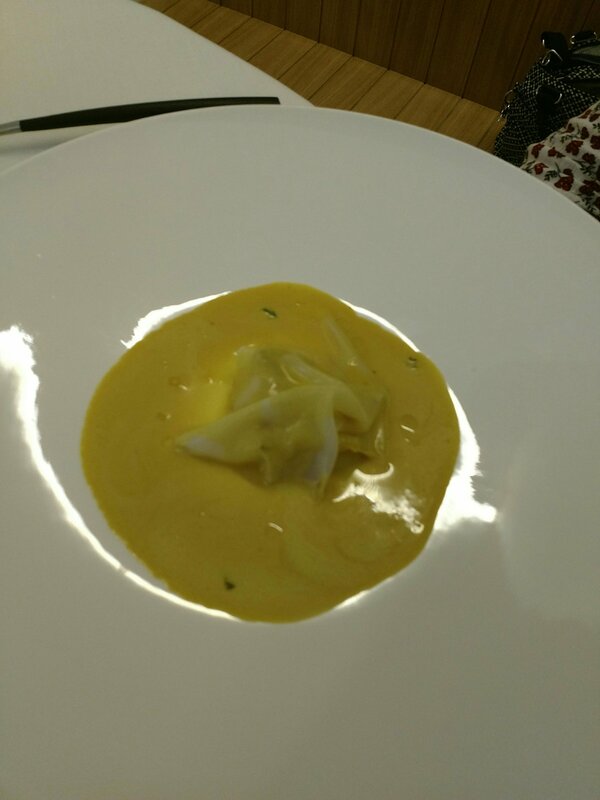 An intense seafood stock base had added to it egg yolk, garlic and olive oil to form a smooth creamy soup. Within it sat raw prawns (from Motril, a town in Granada Province on the Costa Tropical) and corn based savory tuiles. 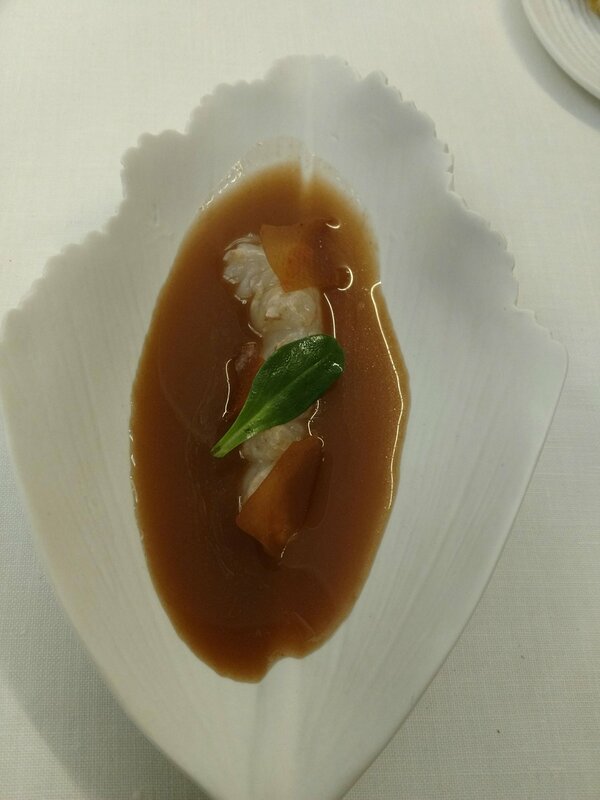 The prawns brought a beautiful sweet taste of the sea to the affair, adding further layers to that provided by the seafood stock base of the gazpachuelo. The tuiles provided a nice textural contrast. Another soup followed, with this being their riff on that most Cordoba of dishes in the form of salmorejo (which you see on pretty much every menu here). Usually it is thick and creamy, but here it was pretty much as far as a soup gets from a traditional salmorejo. The brown soup bought to the palate intensely powerful flavours of sweet tomato and jamón. Whilst the flavours were knockout, it was actually surprisingly delicate. Again seafood featured with a lovely plump, raw scampi, (a proper Dublin Bay Prawn – not the stuff you get breaded), which (as with the prawns in the previous dish) bought a lovely, fresh, sweetness to proceedings. 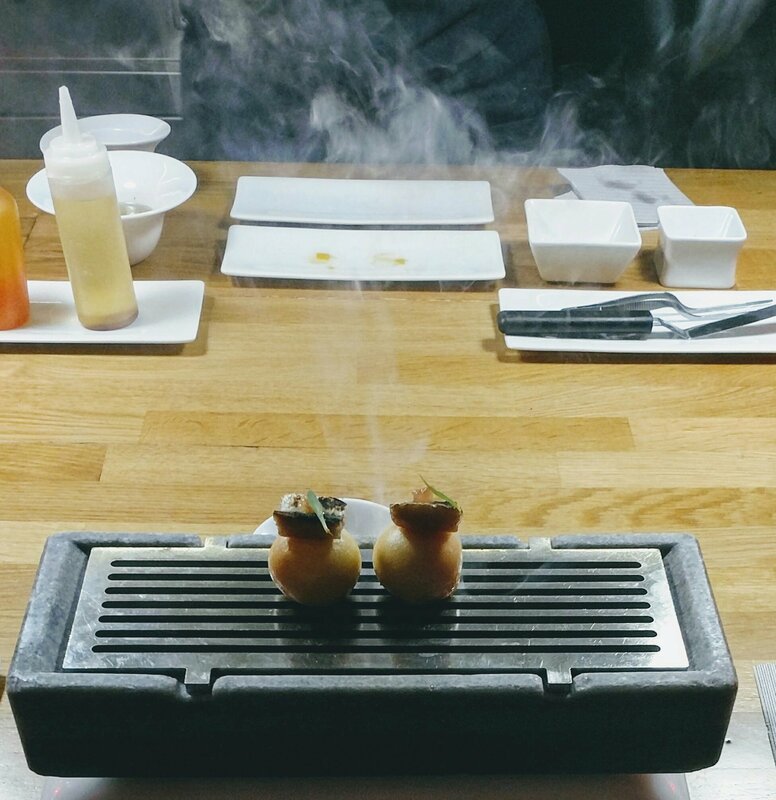 An oyster leaf added a touch of umami and minerality to the dish. This was my favourite of these three soups. Next up was a dish drawing from Spain’s colonial past, with a Mexican theme. Sat on a light corn tortilla were two pieces of a cut of tuna called “parpatana” (from the top of the belly where the fin starts – a new one on me). This cut has, amazingly, roughly the same fat level as ibérico pork and had a real meatiness to its flavour. The tuna was bathed in a luscious meaty sauce and sandwiched between the pork and the tortilla was a shiso leaf/perilla and mint. 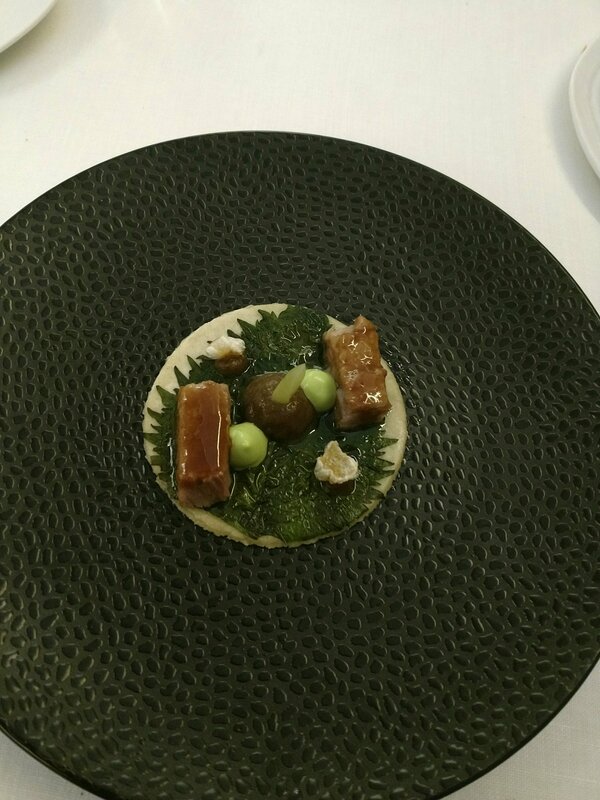 Dots of a avocado cream and crisps up bits of porks skin added nicely to the mix. So pretty you could frame it and more importantly packed with fab flavours. I forgot to take a picture before I dug into this one (school boy error I know). The smell coming off it was so good I couldn’t help myself. 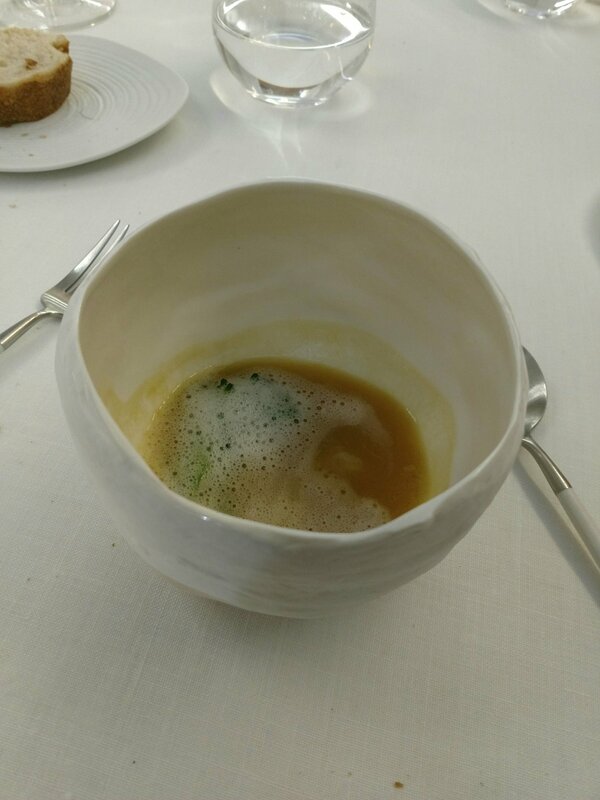 Before I demolished it, a mushroom flavoured foam sat atop a warm, thick, porky broth (close to but not quite jellified) in which various al dente vegetables and nuggets of fatty, flavour packed, ibérico pork jowl sat. Lovely dish, which was full of flavour and interesting textural contrasts. The Sierra Morena is a mountain range North East of Cordoba and this dish gave us another soup, this time a traditional white one. 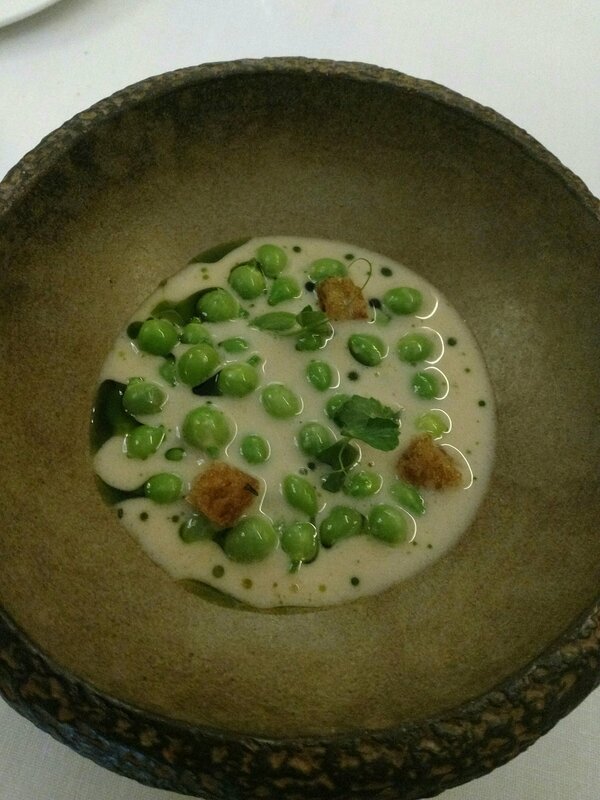 A lovely silky smooth soup was studded with beautifully sweet, crunchy, peas and croutons cooked in ibérico jamón fat. Lovely flavours, but not sure where the egg yolk was? Was it mixed in or omitted I wonder. Choco is Spanish for cuttlefish and my only previous experience of it has been in pet shops (the cuttlebone is used for budgies to nibble on). Notoriously difficult to cook, it can be tough as old boots if not treated very carefully. An utter joy to eat, it covered two pieces of beautifully cooked sea bass and in turn was covered by a delicious garlic and saffron sauce. We asked how they got the choco so tender and thin and were told that they chopped it up and mashed it and the reformed it is a sheet with egg white as the binding agent. Spellbindingly good cooking on display here, making a very humble ingredient into something beautifully elegant and flavoursome. Manolete was a famous bullfighter from Cordoba, who found fame again in Mexico. Here the tribute to him was in the form of a Mexican inspired dish. We were instructed to dig in so that the spoon had all element on it to taste. 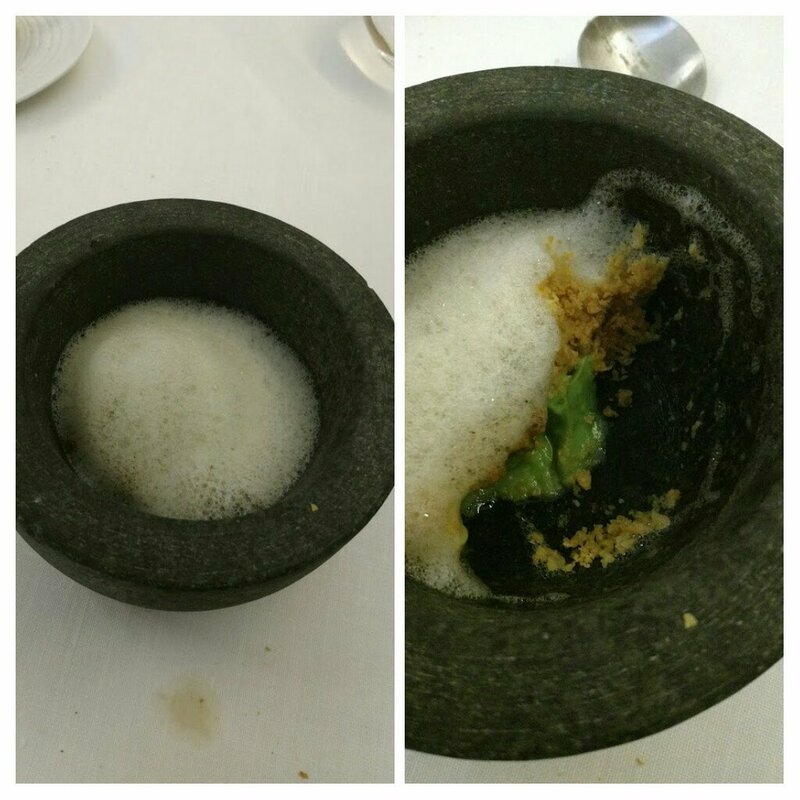 At the bottom was a lovely smooth guacamole, which then gave way to crushed fried tortilla and finally a mushroom infused foam. 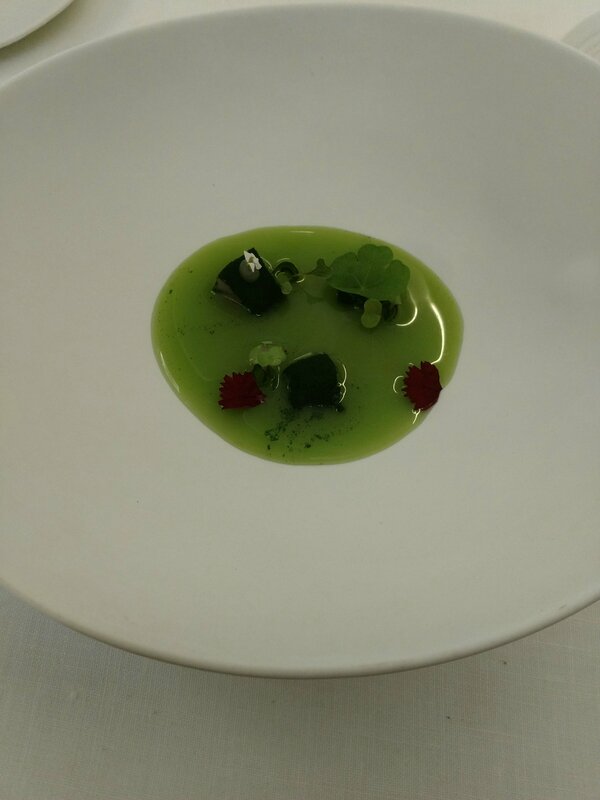 Very delicate and refreshing dish this. Seemingly simple, but the kitchen managed to get maximum sensory effect with the contrasting flavours, smells and textures blending wonderfully. The charcoal oil added an interesting charred flavour to the meat. 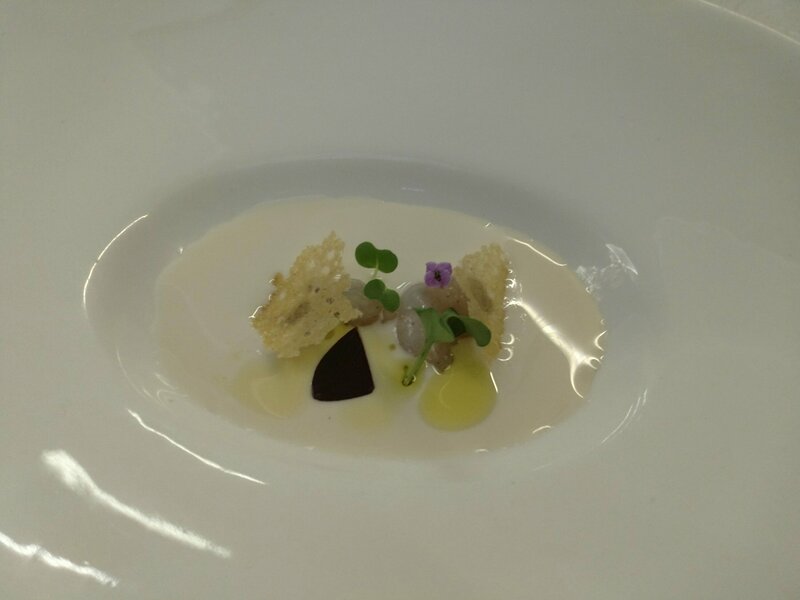 Slices of earthy black truffle were applied at the table and gave this dish a touch of decadence. Very nice, but strangely (as I love duck) mine and Mrs. SF’s least favourite dish of the meal. The first dessert was a perfect recreation of a lime, with the dimples of the skin and even the bit where the stalk attaches being painstakingly recreated. that worked a treat as a palate cleanser. Served in an egg shell, this was billed as a tart, but certainly wasn’t what I would call a tart. I think the translation from “tarta” to tart was a bit misleading. Instructed again to dig the spoon in so as to get the whole gambit of flavours in one mouthful, the bottom was a crushed biscuity base, rich with dark (almost but not quite burnt), crunchy, sugar and I think molasses. The whisky in the mix adding a very pleasing peatiness. The top was a light creamy mixture akin to a zabaione, with the alcohol a touch of a lighter less peaty whisky. This operated to temper the rich, sugary, peatiness of the biscuity base. A lovely dessert. 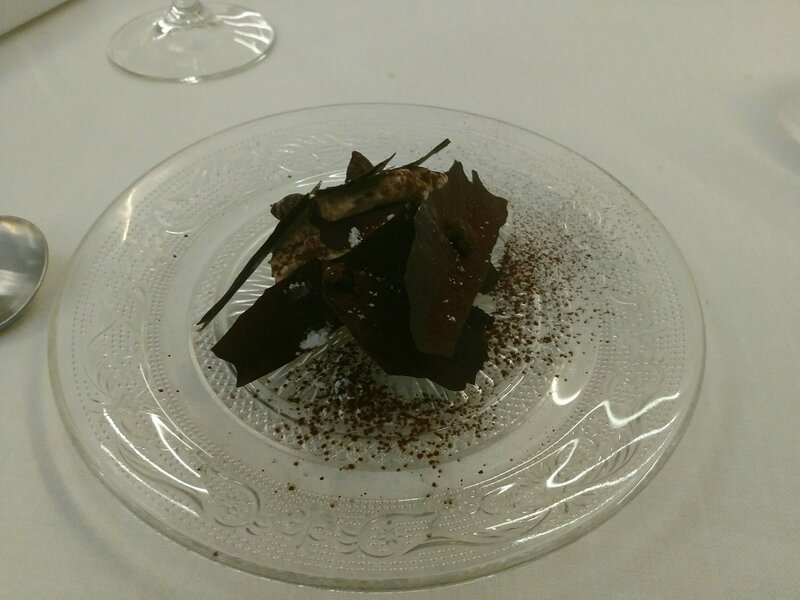 The final pudding was chocolate based, with fine shards of impossible thin dark, bitter, chocolate resting atop an ice-cream and sponge affair. Very elegant dish, with the bitterness of the chocolate working well as a textural and flavour contrast to the sweetness of the stuff it covered. Not quite as good as the lime or whisky tart desserts, but excellent nonetheless. We finished off proceeding with coffee and some very good petit fours (including some superb macaroons). 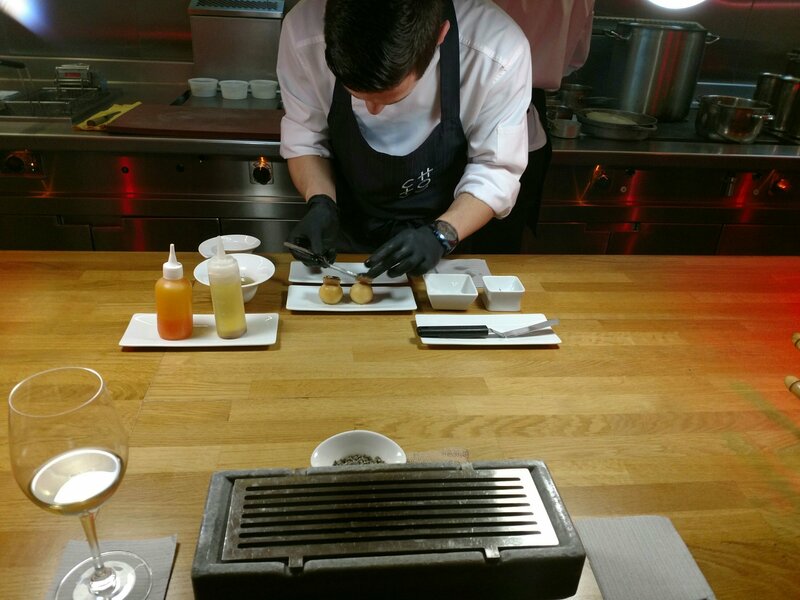 A degustation menu is always a challenge wine wise as there are so many flavours for the wine to contend with. 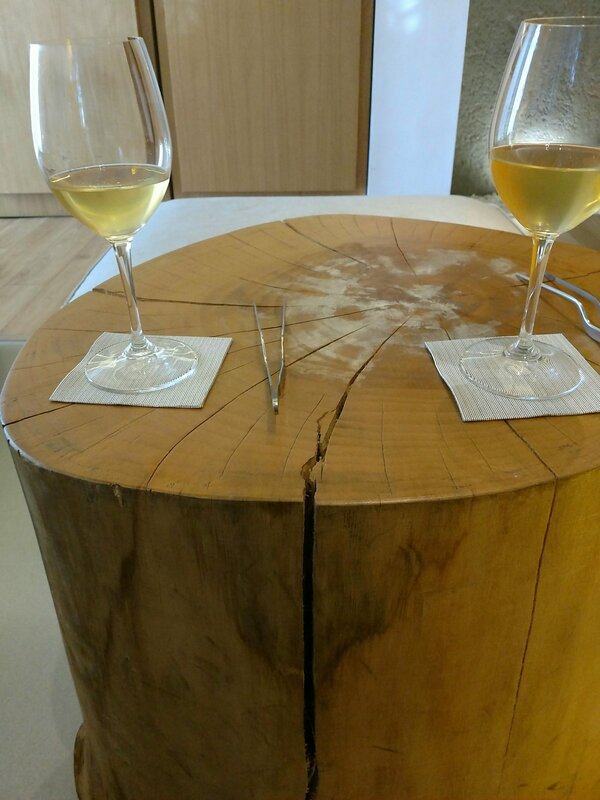 The restaurant offered a wine pairing option, but at €50 each for the pairing with our option of the Kisko García menu I thought it a tad pricey so decided to go for a wine that would be capable of matching the diverse flavours on offer. As with most places in Spain, wine mark ups here are pretty fair compared to the UK. By way of example, the excellent San Roman 2010 from Toro (which was part of a Mystere Club tasting in Cardiff back in January) was €65 on the list and retails in the UK for over £33 a bottle. Whilst I am an absolute nut for Spanish wines, their is no better wine (bar from a Grüner Veltliner perhaps) for the diverse flavours of a degustation menu than a riesling. My eyes were, therefore, drawn to the Leon Beyer Riesling 2015 on the list at a very reasonable €30 (it retails in the UK at around the £15 and I have seen it on a list in a London restaurant for £60). Lovely wine this with classis riesling aromas of orchard fruits (pear and apple) and also a touch of petroleum. I know that latter sounds odd, but it was in this wine very pleasing to the nose. On the palate, whilst dry, it had a touch of sweetness that gave it a lovely balance, with pear and also stone fruits (apricot and nectarine) to the fore. This was a cracking wine, which worked a treat with the huge range of flavours on display from the menu. I was rather pleased with my choice of this wine (even though it went somewhat against the grain to order an Alsace wine in a Spanish restaurant). We fancied something sweet with the desserts and were recommended by our waiter a Maderia wine, which was not overly sweet, for the desserts here. Notes of dried fruit, figs, honey and caramel made this a pleasing accompliment to the desserts on offer. The super meal, without a duff dish among the 17 we tried. Very interesting takes on a number of Andulucian classics, all of which were delightful. Very clever cooking which worked so well at multiple sensory levels (sight, smell, touch and taste). The bill wasn’t cheap, but to my mind more than worth the money for a holiday treat. This was especially the case bearing in mind the amount of work that must have gone into the dishes we ate. Service was excellent, with our waiter being extremely knowledgeable about all elements of the menu, as well as the wine on the list. He achieved that rare feat of being totally unobtrusive, but always being at hand whenever we had a question or request. Would I go back? Yes – it is up their with the best meals I have ever had in Spain (praise indeed from me) and beyond. 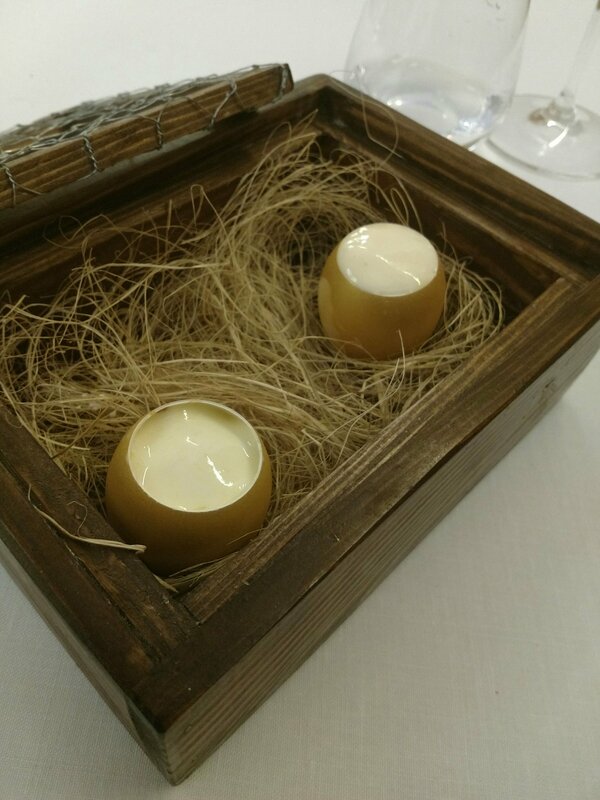 To my mind it was a step up from the one Michelin star places I have eaten in the UK, such as Restaurant James Sommerin and the Pony and Trap (both of themselves very good). Worthy of another star? I should c(h)oco. Address: Calle Compositor Serrano Luceno, 14, 1410 Cordoba. 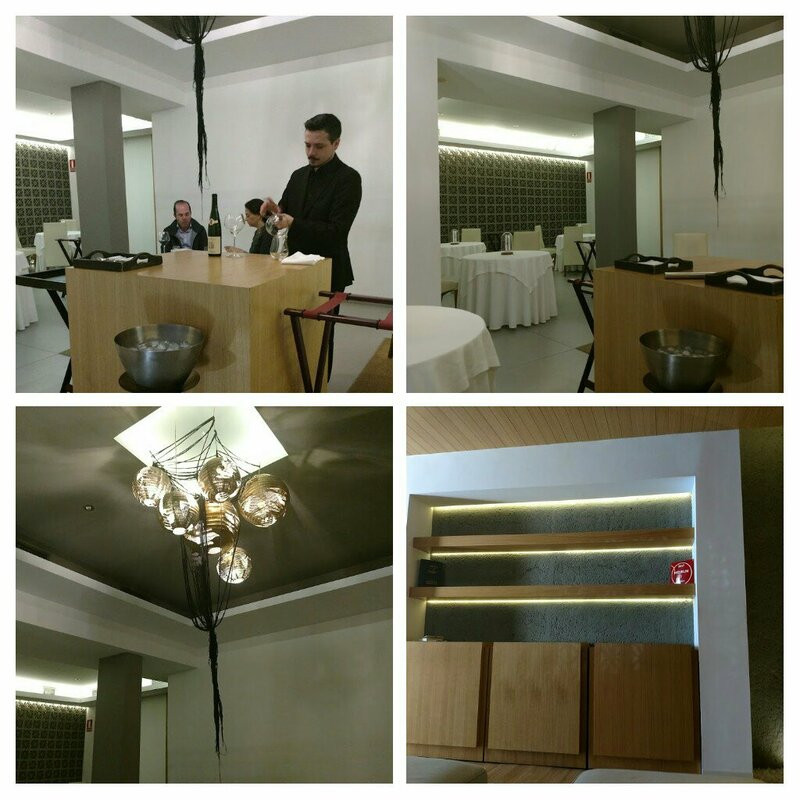 This entry was posted on Apr 8, 2018 by solicitingflavours in Alcoholic drink, Andalucia, Córdoba, City break, coffee, degustation menu, desserts, Drink, Dry white wine, duck, eating out in Cordoba, eating out in Spain, Fine dining, fino, fish, Fixed Price Menu, Food, Food and wine products, France, French wine, Gruner Veltliner, Lunch, lunchtime, Michelin star, Montilla - Moriles, outside UK, Outside Wales, Pork, restaurant review, Restaurante Choco, review, Riesling, seafood, soup, Spain, Spanish wine, sweet wine, taco, Tasting menu, Toro, Tortilla, Uncategorized, White wine, Wine, wine mark up, wine pairing, wine pairings.